90s style is all the rage. I recently got a blast from the past by watching 10 Things I Hate About You with Julia Stiles & Heath Ledger. It was marvelous. In the film, Bianca's pretty in pink prom dress -- or prom crop top with tulle skirt, as it should be called -- is way too chic to ignore. The separate pieces give it a relaxed feel but the satin & tulle show some glamour. I simply couldn't resist recreating the look. 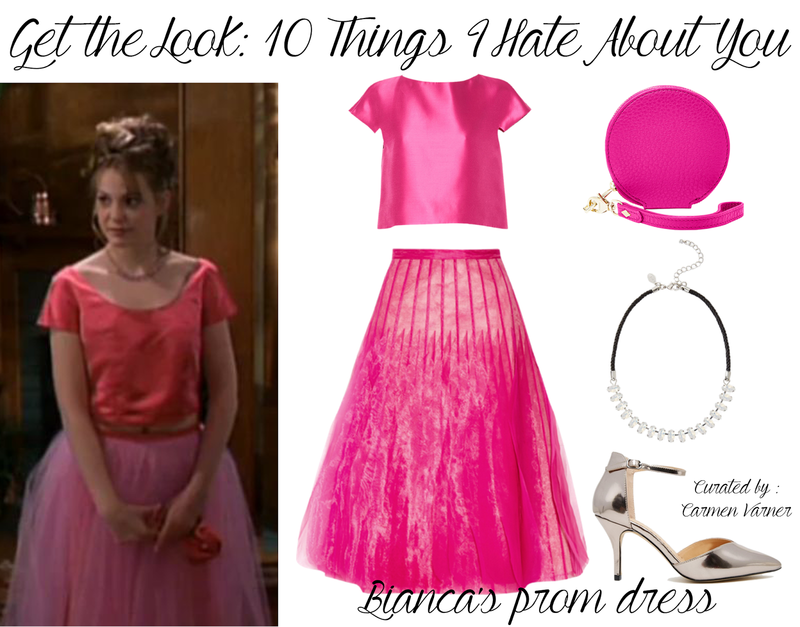 Get the look with Bianca's prom dress from 10 Things I Hate About You! There are two vital items to start off your look. The first thing you need is a shiny, bright pink crop top. It doesn't have to be too cropped just enough to show a sliver of skin. The next thing is a somewhat long pink tulle skirt. This skirt is only $22! You should look like a lovely pink ballerina. These two make a whimsical, vintage-inspired pair. Once you find these key items the rest is up to you. During the prom scene in 10 Things I Hate About You, Bianca holds a unique satin pink bag. It's hard to find something quite like it so I did my best to search for an alternative. All you need is a bold pink coin purse that's small enough to hold your essentials but not large enough to hide the world. Accessorize your prom look with a dainty & sweet necklace of your choice. You might as well go with a retro 90s looking choker necklace. If you have a genuine necklace from the 1990s that's even better, but not all of us are so lucky as to have those lying around. The stretchy chokers are very cheap & easy to find these days. The last thing you'll need to complete Bianca's prom dress look is a pair of cute strappy heels. You'll only need a darling pair to last long enough to capture for the photos. By the time you start dancing you'll probably take them off after a couple of songs. That's how it normally goes at dances. I can vouch for that because dancing in high heels is no easy feat. Love this look, you've just reminded me I haven't watched this film in ages and it's one of my favourites! I'll have to dig the dvd out and give it a watch! I don't know that I have ever seen this film...or maybe I did and don't remember. I love the look you put together, especially the cut of the top! That's really cute! You did a great job! Great idea! Love this movie and pink outfit! i love the looks ! Not going to lie...some of the 90s style that is coming back I love! It's so true that things will always come back! Love the crop top and full skirt, such unique proportions that work so well together! I think this is so much fun, especially as inspiration for prom or something! I love all things pink, and that movie! Great finds. I've never watched 10 Things I Hate About You, but I love your picks. this post is so cute! 10 things I hate about you is one of my all time favorite movies! I seriously love this post and how creative it was. I see tons of bloggers do ootd or get the looks but nothing like this. I admire you for stepping out of the box. Of course I love anything pink - such a fun post! I love this movie! It's one of my absolute favorites. I always thought her prom dress was very interesting, I've had mixed feelings about it. But it's started to grow on me because, like you said, it does have a relaxed yet glamorous feel. Wonderful post! by the way, thanks for visiting my blog, I just followed you! Loved this movie so much in jr.high or whenever it came out. I remember loving this outfit too, thanks for the post! This is such a chic and modern day version of her look. I really like all of the pieces that you chose! I find this look so adorable. One of my favorite things to do is to draw ideas for fashion from other decades! This is one of my favorite movies too so I love this post so much. This is such a cool idea, I love reviving the 90s and 10 Things I Hate About You is such a classic film!